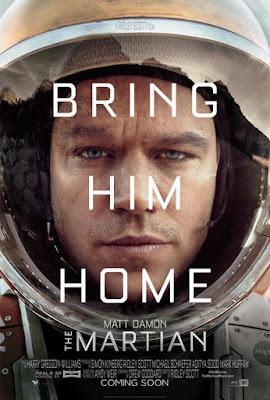 Mark Watney (Damon) has been stranded. On Mars. Now he must figure out how to survive for four years using technology that should, if nothing goes wrong, keep him alive for one month. Meanwhile, the top minds of the world's space programs must try and figure out how to get him home safely. The novel this film is based on has been a smashing success ever since it was first released and I have no doubt the movie version will be just as popular if not more so. Unfortunately, I have not read the book so everything I knew about the story going in had come from the film's trailers. The first thing I will say about Ridley Scott's work on this film is that it is absolutely beautiful. The imagery is stunning and the vastness of his landscapes really give you a sense of just how alone Mark Watney is on this planet so far from home. There is an urgency to every single frame of the movie and the only times you are not on the edge of you seat are during the more light hearted moments, most of which are executed brilliantly by Matt Damon. Whether you have been a fan of Matt Damon to this point or not, you will be highly impressed with the work he puts in on this project and I imagine he should be up for some Oscar consideration come awards time. 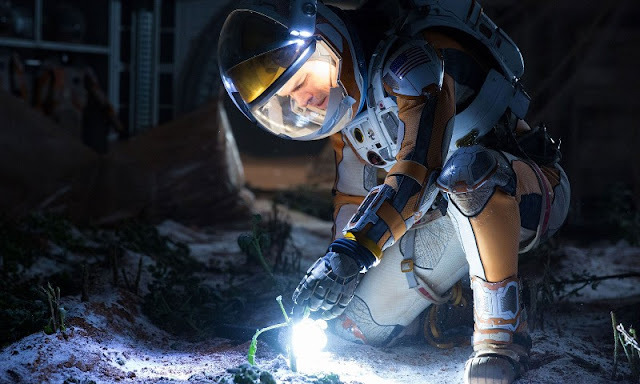 From the moment Watney realizes what has happened to him, Damon has the audience in the palm of his hand and he holds that grasp with the charm and charisma of a true movie star. He gives the character a grounded sense of humility while at the same time exuding the confidence of a person who knows he is very good at what he does and the desperation of knowing the skill and knowledge he possesses might be the only things that will keep him alive. By the end of the film, he will have convinced you that an ordinary man can become a super hero through sheer force of will and determination to survive. Of course, Matt Damon is not the only person in this movie, there are the other members of his mission team and all kinds of people back on earth and the sheer volume of talent filling these roles is most impressive indeed. It must have been difficult for Goddard and Scott to balance out the limited screen time available for so many people and especially since Damon would be taking up the majority of the movie himself. 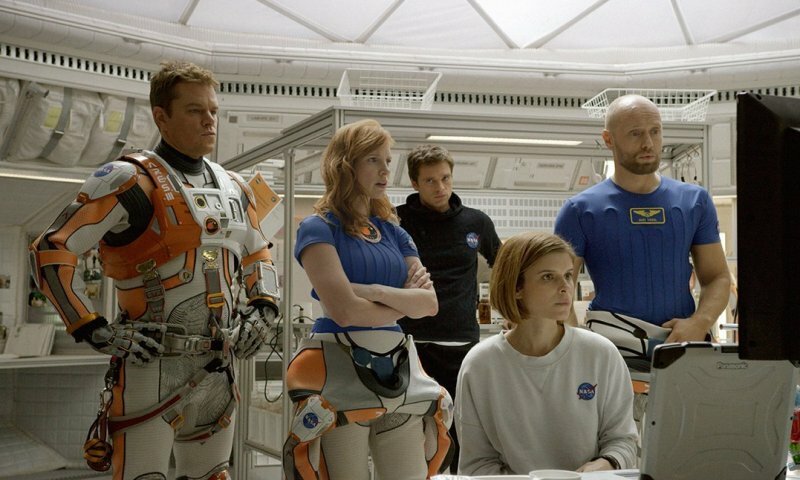 As an ensemble, the cast really works well together and, while it's hard to single out anyone besides Damon, I have to give a special nod to Jessica Chastain who consistently proves why she is one of my favorite actresses on the planet and Chiwetel Ejiofor who provides a steady and confident presence within the NASA team on earth. 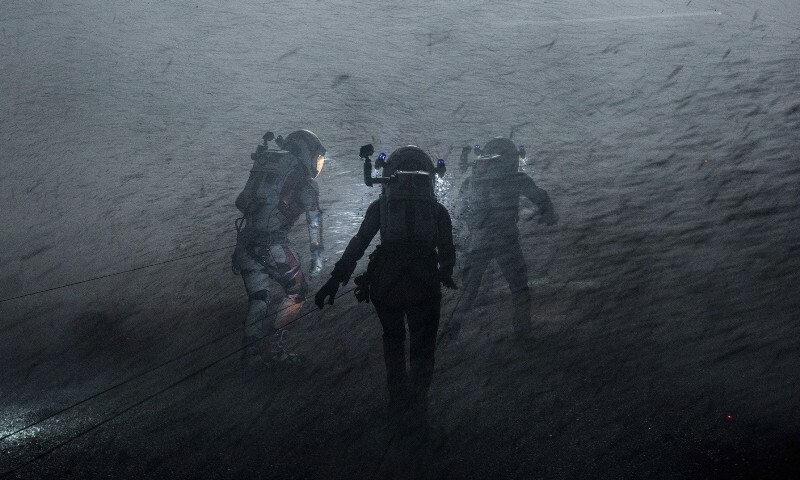 Disclaimer: The picture below is from the beginning of the movie and does not give away anything about whether Watney is reunited with his friends or not. I mentioned earlier how this is such a beautiful film which is in large part thanks to Cinematographer Dariusz Wolski who has also been behind the lens for some classic films including the entire Pirates of the Caribbean franchise. Thanks to his work and the overall direction by Ridley Scott, this is one of those movies you just have to see on the big screen to fully appreciate it. There are moments we see Mark Watney sitting on a hill looking out over the horizon and, as the camera pans out, you really get a sense of just how alone and desolate his situation is. This makes for an interesting contrast to the scenes on earth which are mostly inside offices and small structures that are filled with the types of comforts and luxuries we take for granted every day. People often ask me if they should see a particular movie in 3D and/or IMAX and I always try to give the best information I can by doing some research about how the film was made. From what I understand, several different types of cameras were used to make this film and, when you watch it, you will understand why. 3D cameras were used for most of the film although there are many different perspective shots that all take place within the movie including the use of GoPro cams, laptop cams, and just about anywhere else you would find a recording device. Thanks to the use of 3D cameras, the added effect is very clean with lots of depth and plenty of eye popping moments without it ever feeling like gimmick. Very well done. As far as IMAX goes, I'm not sure if I will have a chance to properly view it in the format so unfortunately not able to comment. 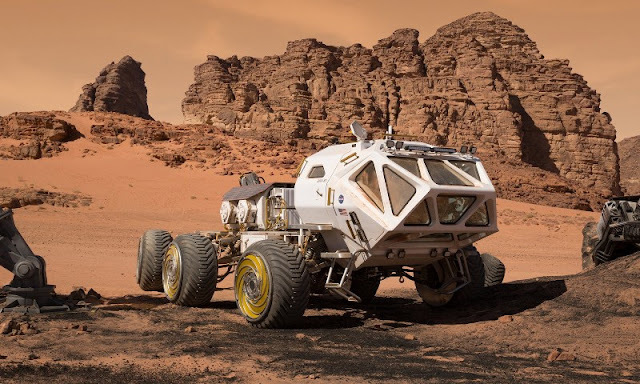 The Martian is easily one of the best films of the year. 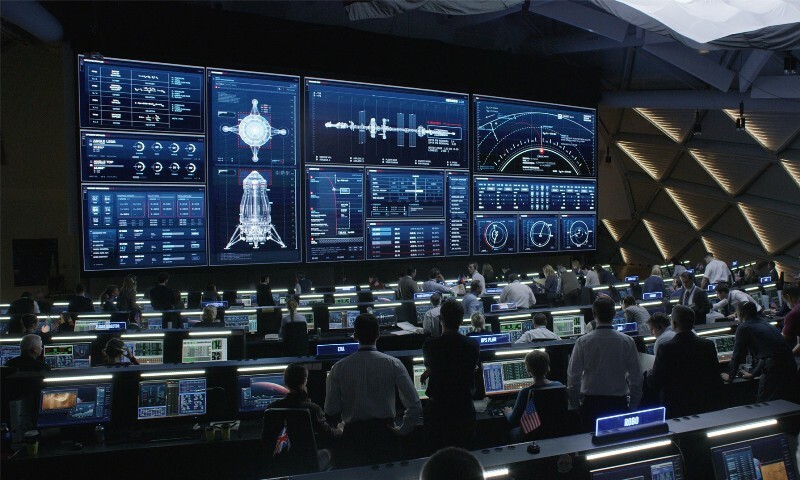 Ridley Scott's latest science fiction epic hits all the right marks and leaves you very satisfied with a true movie theater experience. Please do not wait for this movie to come out on video, it is definitely worth seeing in an actual movie theater. You know, the kind with those fancy digital projectors, real movie screens, big buckets of popcorn, and cup holders for your beverages of choice. 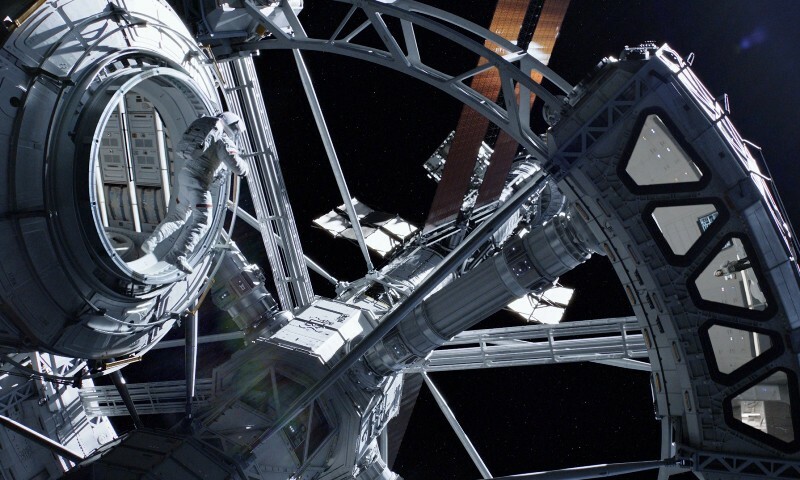 As a matter of fact, you should head out right now to the largest screen you can find (Cinerama, Boeing IMAX) and definitely choose the 3D option if available. Marc - Your reviews are awesome. Thanks for writing this up! Thanks, John! Have you watched it yet?